Accordia Life is a resourceful, agent-focused company with proven expertise in indexed universal life insurance. The company’s products help meet the protection, wealth transfer and small-business needs of customers throughout the United States. Accordia’s success is built on a foundation of experience, exceptional products and deep relationships. 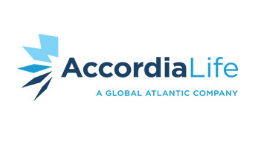 Accordia is a subsidiary of Global Atlantic Financial Group Limited, a multiline insurance and reinsurance company with over $30 billion in assets and 10 offices. Global Atlantic was founded at Goldman Sachs in 2004 and separated as an independent company in April of 2013. The company is derived from the former Aviva USA Life business, which Global Atlantic acquired in 2013.
Who they are they are in the business of helping families protect and provide for their loved ones. This focus permeates our culture as they continually strive to meet your needs and provide solutions for real life financial challenges. This emphasis stems from their corporate values which are inherent principles of their company their people.